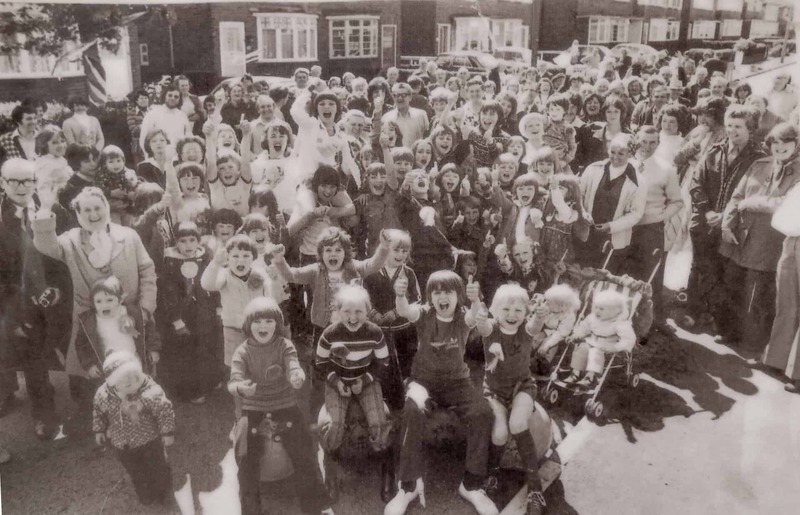 This is a photo of the street party we had at Birch Crescent for the Queen’s Silver Jubilee celebration in 1977. Most of the people in the photo lived in the street. That’s me in the right corner with the smiley face and the headscarf on. And that’s my mother-in-law standing next to me, and my husband over here by the tree. Everyone looks happy, and that tree there is in my front garden decorated with the colours and with the Union Jack. Previous to this, they used to come around on a Sunday to collect some money towards the party, then a few weeks before the party, they had a sponsored walk to raise funds as well. I can’t remember what it was like setting up as I had 3 young children at the time. 3 weeks previous to this we had a fancy dress and my husband rushed into the house, put one of my dresses on, and my wedding hat, and also his working boots. It was a really good atmosphere, and afterwards, we had a couple of day-trips. Things in the street where we live are not quite the same now. A lot of the houses are rented, and people don’t stop for very long.